Holiday Inn Abu Dhabi Downtown is situated in the centre of Abu Dhabi, in the business district, 15 km from the National Exhibition Centre. The hotel features a rooftop swimming pool. With 241 well-designed guest rooms and suites, offering personalized service and distinctive Arabian hospitality. There are massage facilities and a health club, including a well-equipped gym and sauna, an ideal choice for business and leisure travelers. A highlight of the stay is without a doubt the availability of appetizing food and beverages provided in exceptional restaurants and bars completed with a contemporary décor and relaxed ambience. Choose from a variety of options ranging from International, Pan Asian, Arabian to local cuisine. Room service is available 24/7. 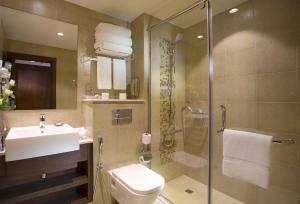 Holiday Inn Abu Dhabi Downtown is 3 km away from Abu Dhabi Marina and its yachting activities. Shopping malls and the Corniche are within walking distance and the property is close to many embassies. 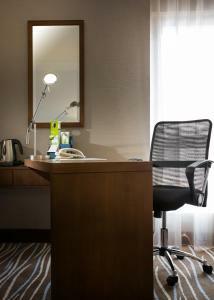 Please inform Holiday Inn Abu Dhabi Downtown in advance of your expected arrival time. You can use the Special Requests box when booking, or contact the property directly with the contact details provided in your confirmation. Guests are required to show a photo identification and credit card upon check-in. Please note that all Special Requests are subject to availability and additional charges may apply.